Carl Phillips leads the Ulster Superbike Championship following a double at Bishopscourt in round one at the end of March. 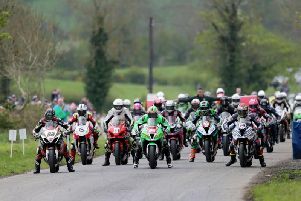 Promoted by the Motor Cycle Road Racing Club of Ireland (MCRRCI), the event has attracted a strong line-up for the traditional holiday race at the Co. Down venue. Gerard Kinghan will be aiming to retain the Enkalon Trophy on the IFS Yamaha on Easter Saturday at Bishopscourt in Co. Down. Randalstown man Gerard Kinghan won the race last year and will be aiming to defend his crown on the IFS Yamaha after a disappointing start to the new season. Reigning USBK champion Kinghan crashed out of the first race in the opening round of the championship at Bishopscourt at the end of March and was ruled out of the remainder of the event with a hand injury. Kinghan, though, will be back on the grid this weekend as he bids to close the gap to series leader Carl Phillips, who won both races last time out as he made his debut for new team JMC Racing. Past winners of the famous Enkalon trophy include Ray McCullough, Alan Irwin, Johnny Rea, Gary Cowan, Sam McClements, Robert Dunlop, Phillip McCallen and Alastair Seeley. This weekend’s line-up also includes Alistair Kirk on the AKR McCurry Racing BMW, plus Nico Mawhinney (Team Polaris Kawasaki), Barry Graham and Ryan Gibson. A number of road racers will be in action as they prepare for the upcoming KDM Cookstown 100 at the end of the month, including Adam McLean (McAdoo Kawasaki), Derek McGee and Shaun Anderson (NW Racing BMW). On Saturday, practice is scheduled from 9am with the first race due at approximately 11am. Admission is £10.